Looking for the best way to record your music lessons, practices, band rehearsals? Here it is. Yamaha's Pocketrak C24 delivers 24bit/96kHz sound quality in the world’s smallest size, and is packed with helpful features. This mini recorder will go with you everywhere for recording band rehearsals, music lessons, conferences, meetings and more. Weighing only 2 ounces (57g) with battery and less than one inch (21mm) thick, it fits easily in a pocket - even a shirt pocket - or bag, so you’re always ready to record. 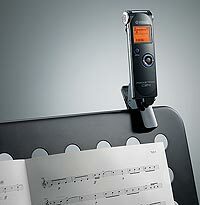 The supplied attachment clip lets you snap the recorder onto a music stand, mic stand or any convenient location. Small and light, it stays where you put it and won’t be in the way. With a large mic built into its compact body, the C24 records sound with excellent clarity. 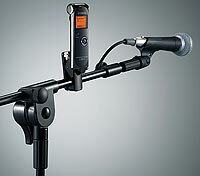 The mic is omni-directional, so you can record over a wide area without having to point it at each sound source. This makes it easy to record large groups like brass bands or choirs. The C24 offers significantly longer recording time than comparable models. A single alkaline AAA battery will power the unit for up to 26 hours in MP3 mode and 7 hours in the higher quality PCM mode. The built-in tuner makes pitch adjustments easy and convenient. When using the tuner, the backlight turns on automatically. The metronome is also handy, giving you the desired tempo via both sound and LED. And you can record the music without recording the metronome sound. The C24 has a built-in 2GB flash memory, providing 26 hours of MP3 recording time (PCM: 7 hours). There is also a microSD card slot for more memory. See inside the brochure* for card capacity details, and our webshop below for media pricing. Slide out the USB connector and the C24 connects directly to a USB port. USB 2.0 compatibility means that an hour of recorded sound can be transferred in 10 seconds. 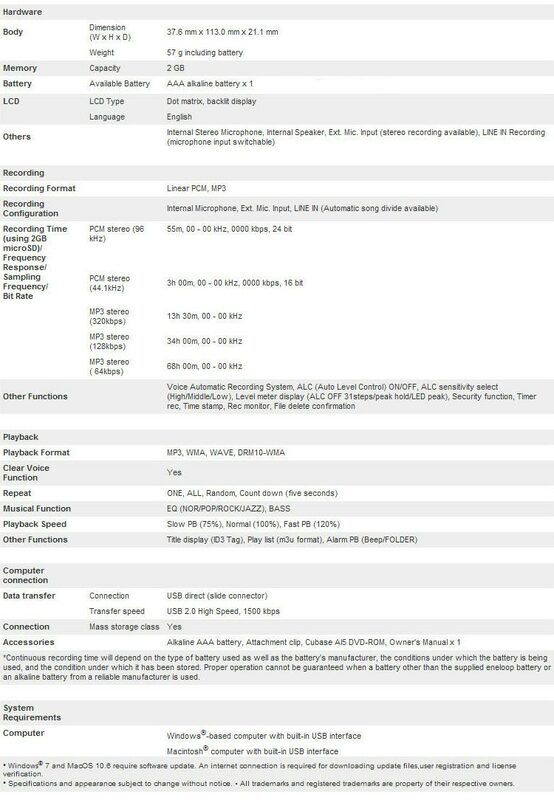 Transfer recordings to your computer and email them right after they’ve been recorded. And because the C24 comes bundled with Cubase AI5 software, you have extensive editing and production capabilities. More about this in the brochure*. A peak limiter prevents overload and distortion on high-level sounds. A 5-band equalizer lets you tailor the playback sound for optimum response. A high-pass filter automatically reduces wind noise and low frequency rumble. Auto Level Control ensures best speech recording quality. Recycle Bin folder makes it possible to retrieve deleted files. *On page 7 of this product's brochure the text suggests that the C24 comes with a 2Gb microSD card as well as its 2Gb of internal memory. This is a textual error and the C24 is not, in fact, supplied with a 2Gb microSD card. However, it does come with 2Gb of internal memory. You may purchase extra memory in the form of microSD cards (see our webshop below) to fit into its external memory card slot.